The singles chart is probably about as relevant today as Vanilla Ice. So much so that, in the UK, the once coveted Christmas number one slot was long ago decided by this year's X Factor winner. 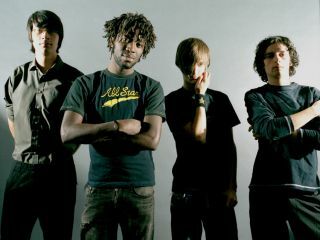 Now, Bloc Party have put another nail in the coffin by announcing plans to cease releasing physical singles. Bassist Gordon Moakes broke the news to 6 Music: "We're talking now about not doing anymore physical formats for singles meaning we won't have anymore eligible singles after [last week's release] Talons." Without much of a warning, Bloc Party unleashed their third LP - Intimacy - as a download, several months before the physical release. Current rules state that a download-only release is eligible for the album chart, but it was a move the band don't regret: "I think none of us were sufficiently concerned about it as a business decision, to not do it - to say, 'If you put it down as a downloadX amount of people might not buy it'." "We have a young fan base so I don't know how doing it the way we did will affect us, but it's still an event to put out a record." Two years ago, Northern Ireland's finest - Ash' (remember them?) - announced that they would do the opposite: no more albums, just one-off tracks. And as far as we know, those plans are still ongoing. With AC/DC's Black Ice flying off the shelves and Guns N' Roses' Chinese Democracy guaranteed to cost Dr Pepper a fortune, perhaps Bloc Party have got the right idea.